Virgin Mobile USA annually hosts FreeFest: one of the largest, free music festivals in the country that annually draws 50,000 people. As the free tickets sold out in minutes, Virgin announced that music fans can volunteer their time at homeless youth shelters or donate hygiene kits to earn tickets to the sold-out festival through The RE*Generation, Virgin Mobile’s charitable initiative to address youth homelessness. As a result of the last four FreeFests through Virgin’s RE*Generation program, nearly $800,000 has been raised and nearly 75,000 volunteer hours and 25,000 hygiene kits have been donated. 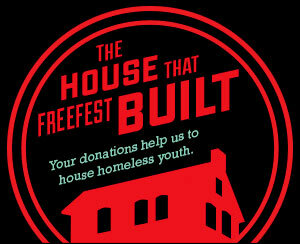 Through previous years, FreeFest fans have funded the development of “The RE*Generation House by Virgin Mobile,” a homeless youth shelter run by Sasha Bruce Youthwork in Washington, D.C.
To love about this campaign: Virgin Mobile leveraging their hugely popular, free event to get fans (primarily millennials) to engage with the youth homelessness cause. Also, upping the social cache of doing good by linking it to this sold-out music festival as *the* way to gain access. Finally, the incredibly tangible impact of having FreeFest fans donations fund a homeless youth shelter.